Today, don Miguel Ruiz and his mother, Mother Sarita, returned to my life through don Miguel’s new book, The Toltec Art of Life and Death. I begins with his heart attack and comma, which happened just a few months after I took part in a very intimate Easter Celebration weekend with don Miguel and his family, including Mother Sarita. I’m also reading this at the same time I’m transcribing my journals from that exact time in 2002. There are no coincidences. I’m being reminded of the Toltec teachings of don Miguel and deepening into the experience of living the truth as a Toltec (artist). I suddenly realized that my book, my story, is vital and important to tell. As I was reading about Miguel giving his mother a mission for her to focus on, I was thinking that I have been looking for a mission to focus on. I have been feeling like I’ve been moving through life with some vague ideas of what I should do, but mostly waiting for something to point me in a direction – waiting for a mission. But now I see it – the book, or more so, the story (stories). So many pieces are coming together to show me the Divinely Guided wild journey I have been on. I am feeling the energy for telling the story, and that it is time, and what I must do now. Thank you, God. “Good Morning my love. And it will be through telling your story that you will learn the lessons even deeper. Review is always good. It will truly prepare you for what is next – of which you are seeing glimpses. You have struggled with the idea of writing a book, but it is not about the book, but the story – the experience, and what it has taught you. As I have said before, do this knowing that it will amaze others, but mostly, do it because it will amaze you! Your life story is Divinely Guided (as is everyone’s). But the amazing part is awakening to the realizations within it. You are seeing the miracles unfold in hindsight. The next realization is to live in the awareness of the reality of your perfectly unfolding Divinely guided adventure. You had become a bit depressed and jaded again, feeling “stuck in the mud”. But this is not true. Life is never stuck. Everything is moving at its perfect and required pace. This invitation and opportunity is for you to choose your level of consciousness and even this is perfect as your are learning. It is exciting. Remember, you have come to live an exciting life! So, let yourself have fun with it as you write The Adventures of Diane Dandeneau (no this is not the title you should use, but it is a great working title for you!). “Look within to know what you need to do and how you need to do it. This is how you put your unique fingerprint on the world. 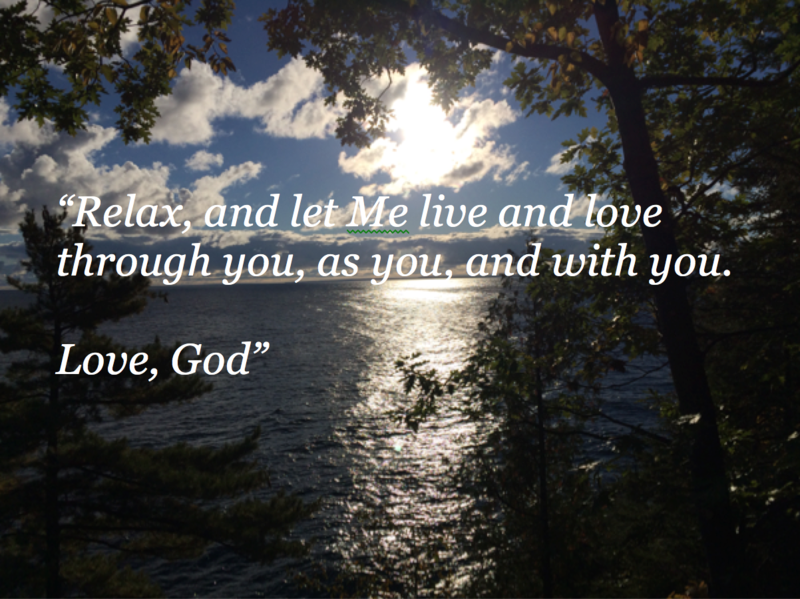 “Relax, and let Me live and love through you, as you, and with you. Good morning, God. I’m grateful for my home, my town, and time with my angel boy (we had a fun Halloween parade yesterday). As I’m writing my book, I’m revisiting my past and seeing even more clearly the lessons of my life. I’m feeling the shift in consciousness even more into being in love and loving, versus doing things and creating for outcome and achievement. I’m seeing more clearly what I had experienced with my story as I write my book – as I revisit my life. I’m seeing that my depression came from my valuation and identification with pursuits and outcomes, and that the identification was the error. I chased my art career and it was successful for a time, but ultimately crumbled. I chased building and selling businesses and products, and in the end they too crumbled. I chased relationships that ultimately ended with great heartbreak and suffering, every time. I lived an extraordinarily adventurous life, flying hang gliders, airplanes, sailing, traveling the world with lovers and alone, taking wild risks, all with momentary and temporary highs and then lows when the adrenaline wore off. I even tried creating my “successful” spiritual coaching business, and it along with everything else that was left in my life was washed away with a flood. So God, I came to you and asked who I am, if not any of this? And you told me, and tell me again and again, that I am You – that I am love, and that love is all there is. So, with everything else removed, I have had no other choice but listen. I’m living this and learning a new way of being in the world from a new level of consciousness – not attached to achievement or outcome, trusting that I will be taken care of and my bills are paid. So far it’s working. Money miraculously shows up and I am guided to do what I need to do, shown were I need to go and who I am so serve. I’m listening and loving. I’m noticing some rumblings of concern and discomfort, as I am stepping into a new way of being (AKA: the unknown). So this is where I come to You, listen and trust. “Good morning, my love. The lesson of this for life for you (and for many), is to awaken. You chased everything from the level of ego and looked for your value and safety in what you achieved. And you found that everything eventually crumbles. So you became depressed and disillusioned as everything you thought you should be doing and valued turned out to be temporal and ultimately insignificant. So your whole paradigm of your reality was destroyed. The final message came through a flood where you experienced complete helplessness and the realization of impermanence as you lived the reality that everything you have can and will be removed at any time. This touched you at a primal level and yet, you are still alive. So, what do you do now? If the paradigm of the ego was in error, what’s left? What is true? The ego says you won’t survive – that you will die. But has that happened? During the flood the thing that showed up was love and compassion and caring for each other. This is was the only thing that mattered. So as you are focusing on love and compassion, you are recreating your life from a new set of values. Your motivation and satisfaction aren’t based on temporary results but eternal truth. Love creates more love which extends more love and is what you are growing and experiencing. This is the only thing of real value and what brings ultimate joy. Now, this does not mean you won’t create art, music, and businesses, nor have adventures and relationships. But your motivation and expectations will be refocused on how much love you are feeling through the inspiration, creation, sharing, serving and receiving. Let the value be set by love and let your self receive love through the exchange of appreciation, love, and yes, money, coming back to you. It is happening. Keep focusing on being the love that you are, without fear. This is the expression of your choice to trust in love, and love will support you to the same degree as you trust it. Completely surrender and trust in love – which is what it means to completely surrender and trust Me. Good morning God. I just finished all the recordings for the meditations I have added to the Journey to the Soul, 30-Day Journaling Challenge based on my book: Journey to the Soul – Connecting to the Truth of Who You Are Through Journaling. It is done. It feels done… finally. I have been offering these for a couple of years and those who have done it have experienced amazing results. I feel good about this because I just offer the invitation, share the reality that we all can talk to God AND get the answers, and the experience speaks for itself. It feels good to have completed this – to have created another piece of art that can be shared with the world. Now, I need to do the work of offering it to the world. This is always the hard part for me – for most artists. We love to create. Market, not so much. “Oh, my love. There are so many layers to this. The first is your vulnerability. Creating is wonderful and also vulnerable. Someone (lots of people) won’t like it – or won’t “get it”, and that is Ok. This is the part of: ‘Don’t care what anyone thinks about you, remember who you are’. You have some fear around this. Yes, step into it so you can see the part of you that still thinks you can be hurt by criticism and rejection. Keep letting that part go as you focus on loving service. Next, don’t follow the crowd. Market/share with the same creativity you create your art with. You actually do this for others, and now it is time to do it again for you. Throw out the formulas and listen to Me as you energetically align with those who truly want and need this. Step into your absolute confidence around everything that you do, and that confidence will speak louder than anything you say or write. This is all in your trust in Me and trust in your creations and your Self. This is the example you want to set. This is who you want to be. This is living a Divinely Guided Life – without fear. It is possible you know. This is what you have asked for. Remember? I’ve been thinking about the Course in Miracles and what Jeshua (Jesus) has been teaching in relation to what God has been teaching me. Good morning, God. You talk to me like you talked to Jeshua, don’t you? “Yes. Jeshua has been telling you and everyone that they too can talk to me and hear me. He had come to be a teacher and is still teaching, as have you. Your message is the same and you are focusing on reminding people that they too can talk to me and hear me, so they too can can remember who they are. From here you know that love is all that matters so everything else can be seen for what it is. And if you forget you know you can come to me to be reminded again and again and again. I won’t stop reminding you. I won’t stop loving you. You can run off and play and then come home to me to give you a hug and tell you how much I love you and how proud I am of you, as you tell me your story of your day. Just like you do with your angel boy. So today, go have fun with the peace and joy of knowing you will come back home to me and you will be loved no matter what the other kids do or say. Good morning God. I’m noticing the different modes that I am in when doing different things. When I’m with you and others in a non-business arena, I’m relaxed and allow things to flow. When I am in a creative mode, without need to get a result, I’m feeling wonderful and expansive. When I start thinking about needing a creation to get a specific result, I get stressed and fearful. I’m letting go of this mode of being. I surrender to you today, and am going to have fun! “Good morning my love. Wonderful. You already know how to create without expectations, so just do that with everything. You have things (results) you want to create, and you see them. But it is not up to you alone to figure out how you are creating them. You are seeing so many miraculous connections and creations – in hindsight. What else do you need to stop doubting me and your beautiful path? You know you are doing what you feel are the right things for you to be doing. So all you need to do is relax and show up. We are in this together (as is everyone in your play). So yes, make into play and have fun! Good morning God. This is Step one in starting my day. Today I’m writing at the computer. “Good morning my love. You can type our messages or write them on paper. You are knowing that you hear me when ever you bring your attention to me – driving, walking, biking, writing, sitting in a room full of people… ‘Good morning God’, is your lovely greeting and acknowledgment of my presence as you start you day – sweet, like the greeting you give to a loved one as you awaken. You know that I am THE Loved One and THE Lover in your life. And it is with me that you know that everyone is also the loved one as well. More love is coming to you as you give more love to the world… Funny how that works. Good morning my Dear One’s. I’m back, safe and sound. I had an amazing journey to the Midwest meeting new friends and connecting with old. It was a beautiful mix of seeing and appreciating my past, visiting where I grew up (including seeing the inside of my family home), and honoring who I am because of it. I could also see it connecting with what I am doing now, who I am doing it with, and where my work and life are going from here. It was an amazing opportunity to see the connections and perfection in ALL OF IT! Good morning my Dear One’s. I’m leaving for the Midwest tomorrow for over a week, and will be writing and then posting sporadically. I’m feeling a shift within myself in how the Daily Reminders will show up. As you have noticed, they have not been very daily recently. I would love your feedback. I have been sharing my process of awakening through this means as well as just posting some quotes with images from the Journals with God. 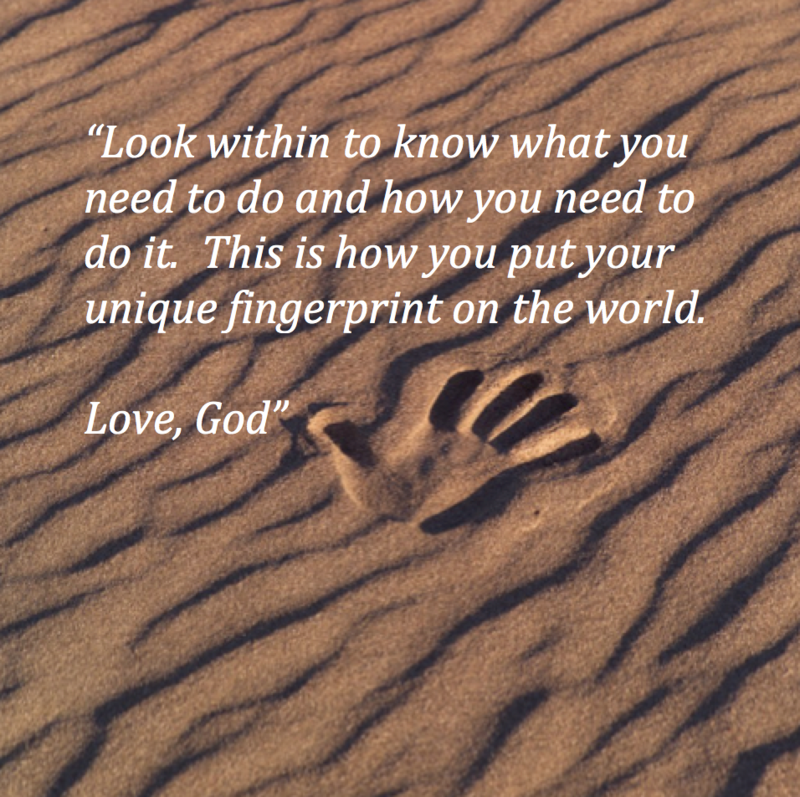 I am finding that I am ready to go beyond sharing the nitty-gritty of my internal process, which is now about maintaining my connection and checking into the level of consciousness I am operating, and shifting to where I want to be with God. It seems that I share a lot of my struggles because that is what I bring to God to shift. The reality is, I mostly feel love and at peace, empowered, joyful, and amazed at life – even as I also feel occasional sadness and disappointment, as natural human emotions. The greater shift is I’m holding it all from a higher level of realization. This process has helped me see and clear the lifetime of illusions from my mind and be able to see it all and yet not be run by any of it, accept when I momentarily forget, and God helps me remember. I’m shift my focus to being in my greatest service with this work. I am thinking about focusing on the inspiring quotes and sharing that part of my writing with the imagery. But, being in service means asking what those who need me want. What would you like to receive? Good morning God. I’m amazed at the immediacy of my transformation as I face my delusions and let them go. Today I’m feeling quiet and at peace. I feel like I am knowing what I need to know when I need to know it. I’m sensing that I am different. Is this where you are been leading me? “Yes! And you also know this. You are embodying My consciousness. You have laid down your old though patterns and to make room for my thoughts to enter. You have devalued the emotional habits of worry, anxiety and fear, and they are falling away out of neglect. The peace that is inherent in valuing only the truth is falling upon you. This is what all of your commitment and work has brought you. And what you have to give is imbued with the love and peace that you have within. Good morning God. I’m focusing on listening to you. I let go of my expectations and needs of certain results. I can see a life-long pattern of doing things for the results and if I wasn’t sure of the result, I would not make an effort just in case I could fail. This way there was no disappointment. More awareness of my own insanity and limiting thoughts and behaviors. So, I now let go of outcomes and do what I feel guided to do without expectations of results. Especially as I step further into the unknown. “Beautiful. This is another shift. Don’t hold back in giving your gifts. What you really want is assurance that you will be taken care of. But that is what stops the flow of love and life through you and to you. This is your past. You have given your life to Me, so trust Me. This is your assurance. What have you really got to loose? Serve with abandon. I promise you that you will be taken care of in ways you can’t begin to imagine. Good morning God. Today I’m focusing on surrendering and allowing. I’m trying to understand what I truly want versus what I want to be different, as I still have some resistance to situations in my life. So, I come here and surrender my resistance to what is, and allow the unfolding of your plan. From here, I want to know what I truly desire and what is mine to do. “Good morning my love. Thank you for coming here. This is the path to understanding and living from the truth, which is the only path to authentic happiness. As you let go of your hold on ideas about everything, you make room for mine. You know nothing, remember? And You know which you I am speaking to. This is where humility is meaningful and useful. Let your ego self become humble and recognize that she alone knows nothing, understands nothing, and is useful only when guided by Me. This is the part of you that must surrender and allow. You don’t have to know/do anything. Now, sit here in this place with me and feel the peace and relief of letting go into profound humility. From here you can become aware of the You that is Me. This is your authentic, powerful, wise, and joyful self. This is where your true desires live and the place where you know what you truly want to do. It gets pretty simple. What I want is love and peace. I need nothing, as I know who I truly am and that I have everything. So, as I need nothing, then my focus is completely on the service I want to give. But as I write this, the real question is, who needs me? Who can I best serve? So, this changes my own focus again. And as I write this, I can see what I do already know. Yes, these are beautiful questions. 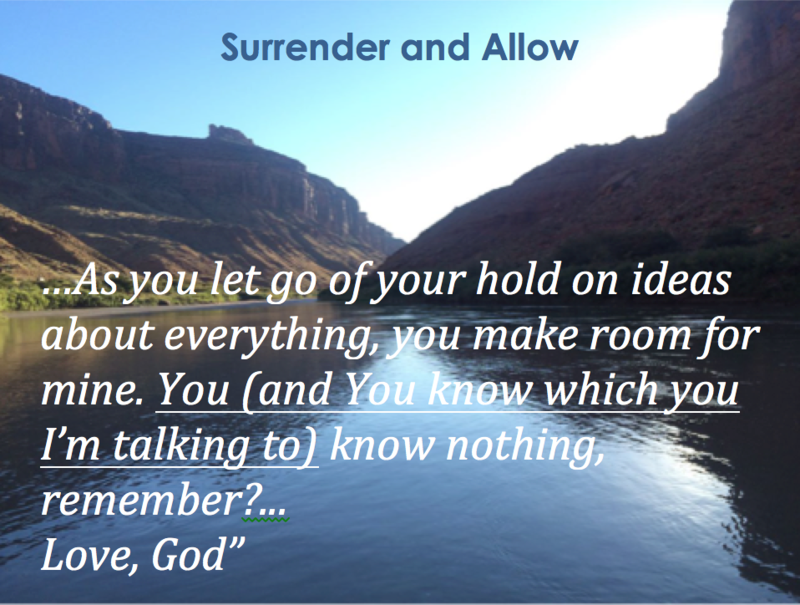 And yes, you do know and can see as you surrender and allow. Dear One, I’m so happy to invite you how to learn to Talk to God AND Get the Answers: HERE. “Good morning my love. Thank you for coming here. This is the path to understanding and living from the truth, which is the only path to authentic happiness. As you let go of your hold on ideas about everything you make room for mine. You know nothing, remember? And You know which you I am speaking to. This is where humility is meaningful and useful. Let your ego self become humble and recognize that she alone knows nothing, understands nothing, and is useful only when guided by Me. This is the part of you that must surrender and allow. You don’t have to know/do anything. Now, sit here in this place with me and feel the peace and relief of letting go into profound humility. I just took a road trip to Moab to ride my bike in the Moab Century with a friend of mine. It was a great trip and I had a lot of time in the car with myself and my mind. I set my intention to go deeper into my Divine connection and asked what I needed to focus on now. 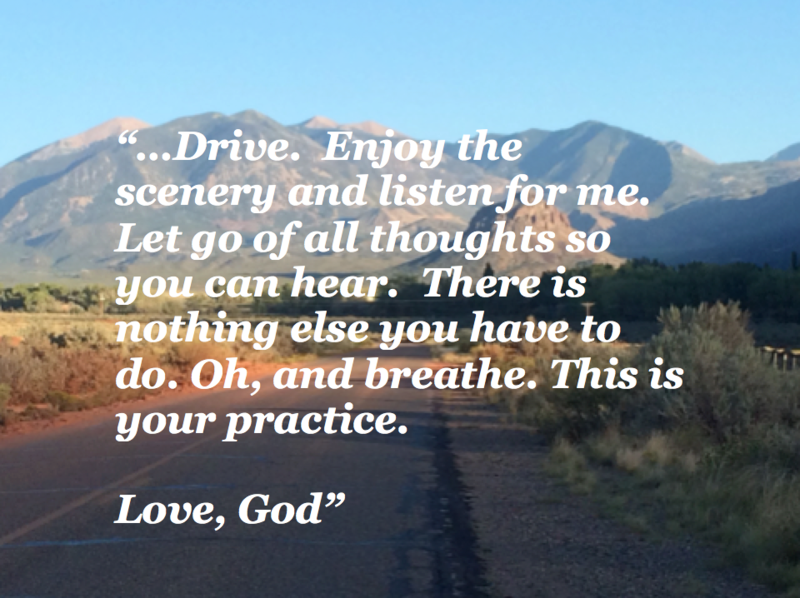 As I did that, God wrote to me (yes, as I was driving, but I wasn’t looking at what was being written). “Good afternoon my love. Drive. You can still hear me. I am writing to you so you can bring your attention here – even as you are driving. You don’t need to worry about what is being written on the page. You do need to listen, however. We have a lot of work to do – all work that you will love if you do it with me. It will be this easy – as Andy said. You need do nothing but show up with me. Focus on your work and the rest of the distractions will be ignored. Bring your attention to me. Listen for me. There is nothing else other than you and I. Feel my presence. Feel my love. This is a miraculous gift that you give your self. Rest here with me. Let go of all thinking as you listen to the music and my voice. We don’t have anything else to do right now. Drive. Enjoy the scenery and listen for me. Let go of all thoughts so you can hear. Oh, and breathe. This is your practice. Dear One, I’m so happy to invite you to watch the Webinar recording: Talk to God AND Get the Answers: HERE.